Review #18367075 5-Star Mountain Luxury 4 Br Cascades Home Theater - Next To Clubhouse AMAZING!! We took our church youth group (just girls) here for our annual "Girls Camp." We loved it!! The condo was well equipped, slept 13 of us very comfortably & the kitchen was very spacious. The garage was an added bonus, the swimming pool, hot tub also proved to be nice amenities. Would definitely stay there again!!! Hi Colette, thank you again for your help in getting us taken care of. The unit was perfect! The owners have thought of everything. It was so well stocked. the location was wonderful and the amenities were exactly what we had been looking for. It sort of feels like this will become an annual pilgrimage for us. The little ones loved it! Thanks for the memories. The townhome was beautiful, felt like home. The view was breathtaking and very peaceful. The drive to Powder Mountain was short and easy. We would definitely go back and would recommend the property to friends and family. We drove to Honeyville and sat in the hot spring mineral pools. Very beautiful, fun, relaxing, vacation. Perfect spring break! The Condo is beautiful with lots of great features. The bedrooms are very quite and the beds are way comfortable.The kitchen is awesome. The view is very nice. Everyone we met was very nice.The workout facility and game room is great. Love that hot tub! Skiing was excellent. Looking forward to coming back. I could not have asked for a better experience! The unit was spacious, luxurious, updated, and clean. It was complete with everything that I could every need or want for a comfortable and enjoyable stay. This unit and the complex have it all! 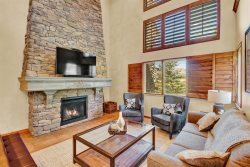 I enjoyed relaxing with a book on the deck overlooking a golf course and view of the surrounding mountains, lounging in the theater room, making smores at the nearby firepit, and taking in the pool and fitness center. You cant go wrong booking this unit for a stay, regardless of your reason for travel! I cant wait for a return trip. Very clean, easy to rent. Walking distance to pool. Great Home Theater. This is a one of the very best places that we have ever stayed. There is PLENTY of room for everyone to have their own space, but comfortable and cozy to spend quality family time. There is so much to do in the Eden area, that we have made multiple trips, just to experience each and every season. You will not be disappointed it you stay here. All the comforts of your very own home. Jim, Brandi and Blair were all first class to interact with. The home is beautiful, large and accommodating with everything you need at hand. It was well cared for, like a brand new home and incredibly clean. We thoroughly enjoyed our long weekend. Thanks! Beautiful Condo, Beautiful Area My parents, siblings, and I were able to come together here, and have a great time. When we plan a central location to get together, normally we have to find separate accommodations to fit us. This one allowed us to stay together and for the adults to be able to visit after the few kids were put to bed. There are lots of rooms allowing for each of us to have personal space, but we could come together in each of the two bigger rooms. The dining table was more of a squeeze for all of us at once. All in all a great place to come together. Our Annual Ski Trip This was our (five guys) second year to stay in this condo. We all love it. It is a fantastic property. Very comfortable with great media room and two king bedroom suites. Adjoining gargage is a big plus. Perfect Family Getaway This town home is located in Moose Hollow Condos in Eden, UT. The first thing we noticed is the beauty of the surrounding area as we arrived. The property is very pretty, peaceful and clean. The townhouse met all of our expectations. This place is extremely comfortable and has the capacity to accommodate a very large family (were were 8). Our children loved the theater room! The place included puzzles and games they also enjoyed. The only thing we brought with us were the personal toiletries (toothpaste, etc.) and the food. The kitchen is amazing! It had every kitchen ware we needed to cook an awesome Thanksgiving feast. The bedrooms are tastefully decorated and the beds sheets were crispy clean and super comfortable, as are the pillows. There are extra covers and comforters in the closets, extra towels, full laundry with soap, ironing board plus iron too. We enjoyed playing at the pool table next to a fireplace. The owner is very friendly and available to help with anything that may arise. There is a market down the road - about 5 minutes away driving distance - as well as a restaurant/pizzeria. We were extremely satisfied with our stay and highly recommend it. We would definitely return. Wonderful Summer Getaway We had a wonderful visit at this property. It was beautifully kept, everything was just as promised, and the owner was extremely helpful and responsive. We had a couple of questions when we arrived and he got right back to us with the answers. We also took a couple of the kayaks with us when we went to PIne View -- what a nice change of pace after a morning of skiing and wakeboarding! We would definitely stay here again. Relaxing Weekend We loved our stay at this condo. The area itself is beautiful and the condo had everything we needed to cook our meals and enjoy down time. The pool/hot tub area was great as well.